As I mentioned previously, now that I am working with Snowy Wings Publishing I’m going to be re-releasing Fourth World with a hardcover edition. In the process of setting that hardcover up, I came across many stumbling blocks and experienced much general confusion due to the fact that IngramSpark’s publishing interface is not intuitive and requires you to do a lot of digging through PDF manuals, sorting through FAQ, and last-ditch Googling to find answers to any of your questions. So in this post, I thought I would share some of the more difficult problems I encountered and the solutions to them! If you are not working with a publisher, the odds are that you’ve set up an imprint for yourself. Depending on where you live, you may or may not have had to incorporate legally with your state. If you haven’t incorporated (or you are publishing with a co-op such as Snowy Wings Publishing that you are not the sole proprietor of), you may run into trouble when you’re registering for IngramSpark, as there is not a way to separate the info you include at registration from the info that gets put on your tax form. In my case, since I was publishing through a publisher that I am not the owner of, I had to register using my legal name rather than a business name in order to prevent conflict on my tax forms. That means that when I went to publish my book, it wanted to use my legal name as the publisher/imprint name. To add an imprint, sign into your IngramSpark account and click on Titles and then the title of your book. Click the blue square/pen beside Imprint and request a new imprint. On my title setup, though, there was no blue square/pen. There was a text link that says “Request another imprint,” but when you click on that link the screen turns black and nothing happens. What worked for me was to click the blue button in the lower right-hand corner which says “Support.” From there, I was able to file a ticket and (after a few back-and-forth emails), I was able to get Snowy Wings added as the imprint name in a little less than 24 hours. This is the most confusing page you will face if you’re having hardcovers made. I had to dig through Google to find a definitive answer on this, and I’m glad I did, because it would have led to a lot of problems if I hadn’t figured this out ahead of time. If you’re making a hardcover, you have three different choices for the binding type: case laminate, cloth (blue) and cloth (gray). Case Laminate is where the cover is actually printed on the hardcover itself instead of there being a dust jacket. You will see this a lot in library bindings, especially for children’s books. The other two options are basically standard hardcover deals, where when you take the dust jacket off there’s just a solid-colored cover. Below this selection is a multiple-choice option for laminate type: Cloth (none), gloss and matte. BUT, if you selected Cloth, don’t be fooled by the cloth option in the laminate menu. If you select cloth, you will get no dust jacket. They will just send your book with plain cloth binding and no cover. If you selected cloth for your binding, the laminate menu now means, “what kind of finish do you want on your dust jacket?” So you need to pick between matte and gloss here. I got glossy for the Fourth World cover, but I have seen some really nice matte finishes as well! Yup. At $27.99, at the standard industry wholesale discount, I will make 13 cents a sale. That’s the absolute lowest I can price this book. And it gets better, because comparable pricing in other territories puts me back in the red, so it will have to be more expensive outside the US. I’ve been at a loss of what to do about this. I could lessen the wholesale discount, which will all but guarantee that no bookstore will ever order this book. But by the same token, who is going to order a $27.99 book as it is? Probably no one. I’m curious to see if retailers mark it at a lower price than this, since they get that big wholesale discount. It might not actually be this horrifyingly astronomical in practice. But since there’s no real straightforward guide to publishing with Ingram that I can find, I won’t know until it happens. In the meantime, author copies ordered through IngramSpark are much more affordable because they cut out the middle-man of all the distribution channels, and allow me to wholesale my own book. That’s why, if you order a copy of the Fourth World hardcover through my online store, you can get it for $14.991)This is only helpful for orders within the US. Due to the astronomical shipping costs of sending packages out of the country, you’ll still wind up saving a little bit if you order a copy through the Book Depository if you live outside the US rather than the ungodly price of $27.99. 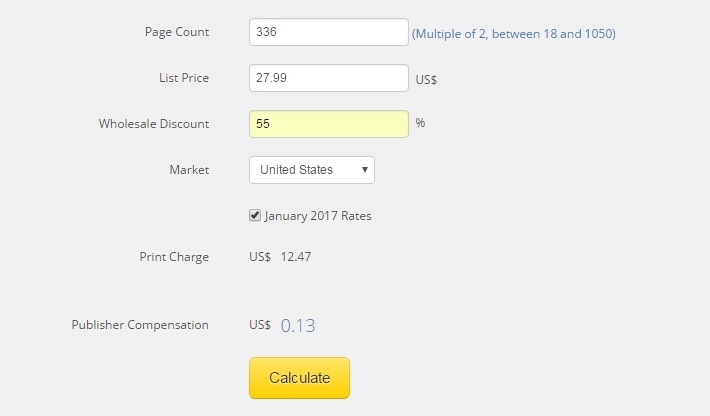 IS does often run promotions where fees will be waived if you use a coupon code, so make sure you research that and see if there are any promo codes running at the time you set up your book!